If you have a set of calendars that you frequently view together, such as your work colleagues or your family, using calendar groups makes it easy for you to see the combined schedules at a glance. Calendar groups can also include resources, Internet calendars, or SharePoint calendars. Note: This feature requires a Microsoft Exchange Server account. In Calendar, on the Home tab, in the Manage Calendars group, click Calendar Groups > Create New Calendar Group. Type a name for the new calendar group, and then click OK. Under Address Book, choose the Address Book or Contact list from which you want to pick members of your group. Browse for names or type them in the Search box, click the name that you want, and then click Group Members. Repeat this step for each calendar that you want to include in the group, and then click OK. In Calendar, on the Home tab, in the Manage Calendars group, click Calendar Groups > Save as New Calendar Group. The new calendar group opens beside any calendars or groups that were already open. To add other calendars to the view, select the check boxes of the calendars that you want in the Navigation Pane. To add a calendar to an existing calendar group, in the Navigation Pane, drag it to the calendar group that you want. In Calendar, on the Home tab, in the Manage Calendars group, click Open Calendar, and then click the type of calendar that you want. Browse for names or type them in the Search box, click the name that you want, and then click Calendar. Repeat this step for each calendar that you want to include in the group, and then click OK. The added calendars appear in the Shared Calendars folder in the Navigation Pane. Note: In Schedule View, you can click the Add a Calendar box at the bottom of the view and then enter the name that you want. The calendar is added to the Shared Calendars folder in the Navigation Pane. In the Navigation Pane, drag the calendar from Shared Calendars to the calendar group that you want. Note: You can move a member of any calendar group to a different group. In the Navigation Pane, drag the calendar to the calendar group that you want. In the Navigation Pane, select the calendar check box. On the Home tab, in the Arrange group, click Day, Work Week, Week or Month. The calendars are arranged side-by-side. Click the View in Overlay Mode arrow on the tab on each calendar that you want to overlay. 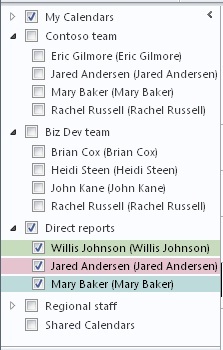 Any calendar in the Navigation Pane can be viewed together with any group, even if it is not a member of that group. You can also view multiple calendar groups together. Select the check box of any calendar or calendar group that you want to view. You can hide any calendar from the view by clearing its check box in the Navigation Pane, or by clicking Close Calendar on the calendar's tab. This only changes the calendars in the current view. It does not remove any calendar from a calendar group. In the Navigation Pane, right-click the calendar group that you want to delete, and then click Delete Group.